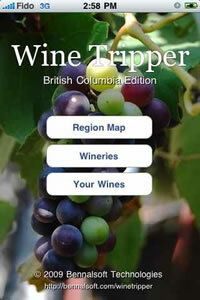 A couple of weeks ago, I was contacted by an employee of Bennalsoft Technologies, who asked if I might be interested in reviewing an iPhone app of theirs, Wine Tripper – British Columbia Edition. 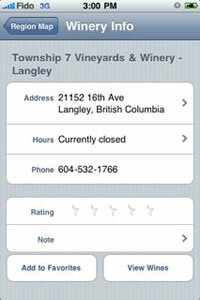 Being both the iPhone and wine geek that I am, I was pretty eager to give it a go, so I said, “Sure!” I also figured that with all the visitors that are set to visit our province for the Olympics next month, this could be a very timely app to have on hand. OK, let’s get down to having a look at Wine Tripper. 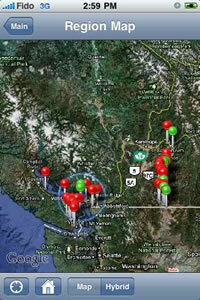 Let’s have a look at the “Region Map” section.It takes you to a Google Map of BC and shows drop-pins on all of BC’s wineries. You can then zoom in and click on the pin for more info on that winery – nice feature. When you click on “View Wines” in the next screen, you’d think it would take you to a list of the winery’s current line-up, but nope. What you get taken to is a “Your Wines” screen, which both lists and allows you to add wines from this winery to your personal wine list. It would be really nice if each winery’s selection of wines were already in here and easily selectable. Instead, you have to manually enter the wine. 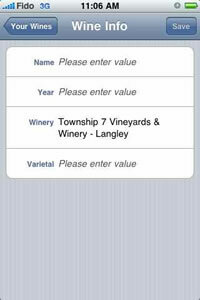 One thing of note here is that in the “Varietal” box, if you tap to go in and edit, there is no way to simply input text (as you would need to if the wine were to be a blend of more than one grape). 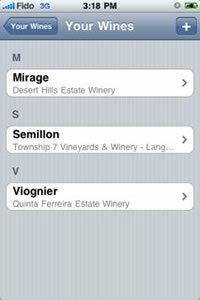 What you’re taken to is a sortable drop-down list with single varietals. They’ll have to fix this – maybe by adding a simple text edit icon/button. I tried tapping on the varietal, hoping that would take me to a text input screen, but no luck. I also think that for wines whose names are just the varietal, that should be a choice in the wine name menu. 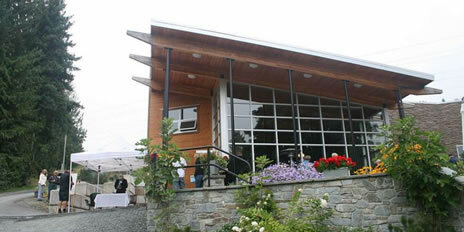 The wine’s name should also be below the winery’s name and varietal on the entry screen. That’s my personal opinion. OK, back to the home screen. Let’s have a look at the “Wineries” section. You’re taken to the following screen with its selectable sub-sections. 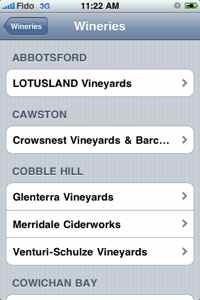 Tapping on a winery’s name allows you to do all the same stuff that the winery screen in the map did – add wines, view wines, etc. 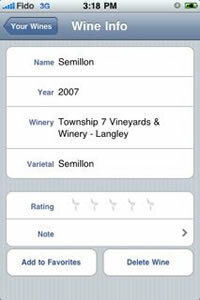 Without starting to sound too much like a broken record, going back to the “Wineries” screen allows you to view BC wineries in each category – “Area“, “Rating” (sorted by your rating, though having the ability to synch with others using the program would be great to see how others have rated a particular winery), “Favorites” (side note to the developers – we spell “Favourites” with a “U” up here in Canada – and this is a Canadian wine region app) and “Proximity” (which uses the iPhone’s GPS to locate you and show wineries that are close-by in a list, sorted by actual physical distance from your location). A cool feature to add here would be to view other users of the program who may be nearby so you can organize tasting groups. 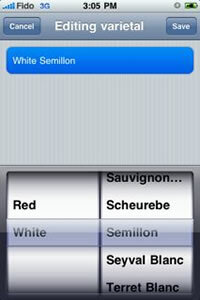 Once you’ve entered the data for a wine, you can then view your personal list of wines from this winery. 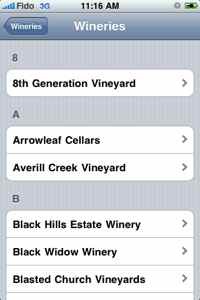 Tapping the “Alphabetical” menu item takes you into a list of any wines you have saved, and obviously enough puts them in alphabetical order. One thing that became apparent as I used the app was that the page titles don’t really synch with where you are in the app. I’m in the “Alphabetical” list of my wines, but the page title I’m seeing is simply, “Your Wines”. I constantly had no idea what sub-section I was currently browsing. It would be nice to see a fix for that. Now here’s another sign of things going wrong. 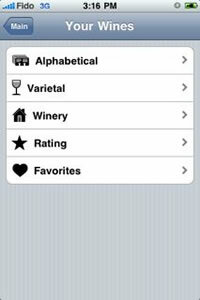 Why can I rate and make notes on the wine now, but couldn’t when I initially entered the wine? The new wine screen should look exactly like what I’m seeing here, if you ask me. That’s a pretty big usability blunder. Back to the “Your Wines” menu and into the “Varietal” section. Oops! I had 3 wines entered. Why do I only see 2 here?? Another app bug found. The program isn’t listing my Quinta Ferreira Estates Viognier at all (which was very tasty and will be reviewed later this week). That needs to be fixed. OK, it’s back to the “Your Wines” menu we go and into the “Winery” section. Again, the program isn’t listing the Quinta Ferreira Estates winery, which I had entered. Another glitch… Again, that needs to be fixed. All right, it’s back to the “Your Wines” menu we go and into the “Rating” section…. and again, the program isn’t listing the Quinta Ferreira Estates winery, which I had entered. Another glitch… Again, that needs to be fixed. I’m staring to feel like a broken record here. So, let’s head back to the “Your Wines” menu we go and into the “Favorites” section (there’s that US spelling again). 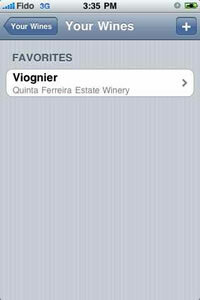 Well, if it isn’t the previously missing, Quinta Ferreira Estates Viognier! Maybe flagging it as a favourite hid it in other screens? No idea, but it’s nice to see it wasn’t lost completely. OK, so that’s it… whew! What Bennalsoft has here is a really nice start to a BC wine program. I really like the map and proximity features… and I really don’t like the missing wine glitches and the US spelling (maybe that’s just me). All in all the current version is just OK. It’s maybe worth a try, but the $2.99 price tag may be a bit more than I’d pay right now. I reviewed the 2005 vintage of this wine a couple of weeks ago and quite liked it. This one? Not so much. Maybe it’s my palate this week, but I’m not liking it. The nose has a smoky-sweet BBQ sauce kinda thing going on. That pretty much tells you what’s happening. It’s like there was a fire near the vineyard and the smoke infused the grapes. It’s not working for me. It’s like you’ve got a handful of crushed blackberries (sounds good so far) and then douse them with a generous dose of Jack Daniels BBQ sauce (OK, not sounding so good anymore). That’s followed up by a short and slightly hot (15.8% booze) and sour finish with not much going on in the middle. ‘Nuff said. I’d say to give it a pass. Either search out the 2005, or another Zin in the price range. $31.99 at Liberty Wine Cellars. Hi folks! Long time no post. I’ve been off holidaying and doing other summer-like activities. There were beaches, water, swimsuits and wine… oh yes, there was wine – lots and lots of wine. I’ll write a catch-up post on that later. This post has something I don’t often do – negatively review a wine. Most of the time, I take a relatively educated guess and come up pretty darn happy. Sometimes though, I take a recommendation and don’t really find it up to snuff… like this one. It’s 100% Tempranillo that tastes like it was stewed with a lot of grape stems and oak chips (no barrels here, I’m thinkin’). It’s lightly fruity with an unsatisfying, bitter edge and a short finish. It’s OK for the money, but there are others I’d go to before buying this again in a pinch. All in all, I’d give it a pass. $14 in private wine shops in Vancouver. OK… so anyone who reads this blog at all knows I’m a huge fan of a well-made Zinfandel. I’ll travel far and wide to get my hands on a good bottle of Zin. So, I’ll get right to the point here… this isn’t one of them. It’s thin, slightly bitter and although it shows some decent fruit, it lacks that roundness and balance that a good Zinfandel possesses. I’ve had some great field blends – wines that have a certain percentage of each grape that are grown, harvested and fermented together from the same vineyard. This one has 80% Zin, 13% Petite Sirah and 7% Barbera and 14.5% booze. There’s some ripe red berry fruit and a minerality on the nose that is nice, but having had this wine once, it’s not one I’d buy again. There’s much better stuff out there. $29.99 in LDB stores here in BC. I picked this one up last night because I did a hard road ride and had a craving for protein… in the form of a nice big steak. Cabernet and steak: a match made in heaven. Problem with this theory is that not all Cabernets can actually stand up to a good steak… and this, unfortunately is one of those. I’ve had some wines I’ve absolutley loved from this winery, so maybe I’ll give a future vintage another try. This was perfectly good, but lacked that oomph you look for from a really good Cab. It had none of the grippy tannins that would have helped with the bit of fat in steak that normally compliments a good wine. It was like a vanilla Cab. – all nice and normal, with no standout character. It would be nice with some bread and maybe some Brie. I just expected more for the $39 this one cost (gotta’ love the tax we pay up here). C’est la vie… It’s all part of trying wines. You win some and you lose some… This wasn’t necessarily a loss, but more like a game where the Canucks play Minnesota: even if they win, you want to forget about the game because it was just boring to watch.